TS Vidya Volunteers Online Application Form 2017, TS Online Application Form for VVs Recruitment 2017 and District-wise, School-wise VVs Vacancies,Schedule,VVs Recruitment Schedule,Guidelines, Instructions,District wise DEO Websites, Vidya Volunteers Online Application Form. 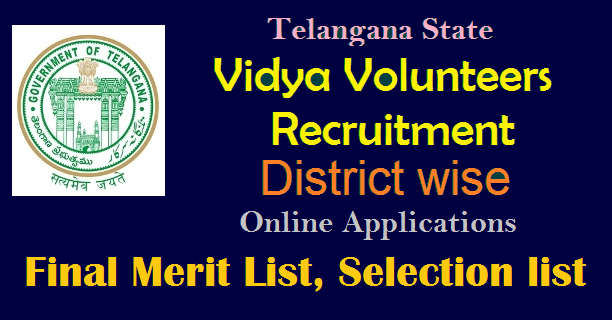 TS Vidya Volunteers VV's District wise online application form, Subject wise Final Merit List, Selection list 2017 District wise, Subject wise Vidya Volunteers Merit List in Telangana. TS Vidya Volunteers Merit List, District wise Online VVs Merit List 2017, Telangana VVs Recruitment Results 2017, TS Engage of Vidya Volunteers Merit List, District-wise VVs Selection List, District wise DEO Websites, Subject wise and Medium wise Merit List of Vidya Volunteers. District wise VVs Recruitment Information available at District Educational Officers district educational officers deo mahabubnagar , deo wanaparthy , deo nagarkurnool , deo jogulamba (gadwal) , deo ranga reddy , deo medchal (malkajgiri) , deo vikarabad , deo hyderabad , deo medak , deo sangareddy , deo siddipet , deo nizamabad , deo kama reddy , deo adilabad , deo nirmal , deo kumarambheem (asifabad) , deo mancherial , deo karimnagar , deo rajanna (siricilla) , deo jagityal , deo peddapalli , deo warangal urban , deo warangal rural , deo janagaon , deo jayashanker (bhupalapalli) , deo mahabubabad , deo khammam , deo bhadradri (kothagudem) , deo nalgonda , deo suryapet , deo yadadri district wise VVs application forms, merit list are available at district's official web portal. Telangana State government has decided to appoint 11428 Vidya volunteers for strengthening primary schools across the State. Chief Minister K Chandrashekar Rao discussed with his deputy Kadiyam Srihari on the need for strengthening school education which needs teachers for this year. It was decided to appoint Vidya volunteers for the academic year of 2017-18. The Chief Minister asked the officials to take immediate measures to appoint Vidya volunteers. According to Education department officials, the total teacher vacancies are raised to 11428 and these vacancies to be filled up with the VVs for 2017-18.The honorarium to the Vidya Volunteers for Rs.12000/- (Rupees Twelve Thousand only) per month per head. All the Mandal Educational Officers in the district to accept the signed print outs of applications submitted by the candidates along with necessary enclosures duly verifying with original certificates. Necessary arrangements shall be made in all the Mandals for the verification with regard to the eligibility of the candidate for the post/posts he/she has applied for, caste and other special eligibility and local candidature etc. Arrangements shall also be made to obtain such received application form from the Mandals and to enter the corrections, if any, mentioned by the candidate in the print out copy. The details of Vidya Volunteers permitted district-wise, school-wise will be made available on district level websites and eligible candidates shall apply through online as per announced schedule. They are further requested to strictly adhere the instructions and complete the process as per schedule. No manual applications shall be entertained under any circumstances.